My December 2013 and Year End Summary is long overdue, but better late than never! I’ve been busy switching my hosting company from MediaTemple to a blog hosting company called “A Small Orange“. You can read about some of my early issues, but things have been very smooth for the past 2 weeks, and service along with performance have been great. So far, I’m very satisfied with the move. 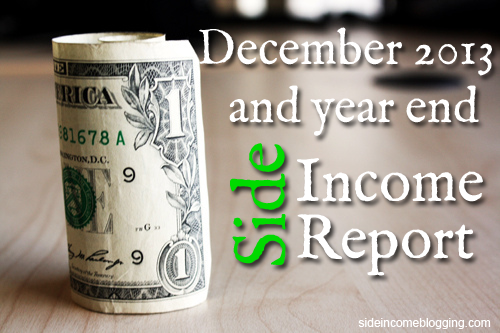 But, back to the my December Side Income Report! December was actually a really good month for me both in Side Income Services work and for income from my various websites. The income numbers below represent combined income from all of my sites and my services work as well. Adsense for December was the highest Adsense month I’ve had since 2009, which is when I was still blogging on my very first blog, Gather Little by Little. This income is from my niche sites, but primarily from our life style website: Blue Ridge Mountain Life. EBay partner network income should be the last month I report EPN income. I had two websites that were using EPN, and due to continued Google penalties, and EPN changing their affiliate income structure, the sites were no longer worth my time, and I deleted them. I gave up trying to sell them because of the Google penalties against the site. Sometimes you just have to “cut bait” and focus on your sites that successful and earning money. Services work was high this month due to a few clients trying to close out their year end financials for tax time. Usually December is a slow month for me, so I was pleasantly surprised. My only expense for December 2013 was hosting at $100.00. This cost will be reduced starting in January since I switched hosting to A Small Orange, as their pricing the for an almost equivalent plan is $50.00/month. 2013 was the largest income year I’ve had, again, since 2009 when I sold Gather Little by Little. While not the total income I had hoped for the year, I certainly can’t complain. I had set a goal of $1000.00 per month in 2012, and while I didn’t reach that goal each month, overall I exceeded that goal by a little over $200.00. Remember, that the $1,000.00 per month goal was a combination of services and blog revenue. As I’ve shared in the past, I am slowly working to convert my side income business model to a more passive income model, meaning less income from services work and more income from website income. Thus, my goal for 2014 is to earn $1,000.00/month from website income alone. Any services work on top of that will just be “gravy” (as we say here in south).